Paul Ryan trashes House gun control sit-in as "fundraising scheme"
House Speaker Paul Ryan slammed the Democratic-led sit-in on gun control, calling it a "publicity stunt" and a "fundraising scheme" during a press conference Thursday. "We are not going to allow stunts like this from carrying out the people's business," Ryan told reporters, just as the House's #NoBillNoBreak protest surpassed the 24-hour mark. "Why do I call this a stunt? Well, because it is one - let's just be honest here." "They're staging protests," the Republican leader said. "They're trying to get on TV. They're sending out fundraising emails." "If this is not a political stunt, why are they trying to raise money off of this -- off of a tragedy?" he questioned, reading off some emails Democratic committees had sent out Wednesday. "I'm really not sure what their plan and endgame is here...They know this isn't going anywhere. It already failed in the Senate." 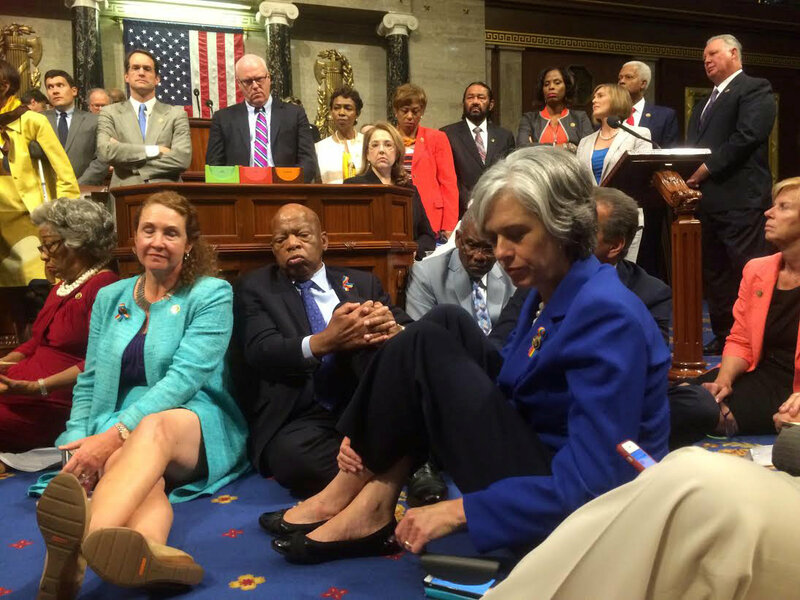 What's next for the Democrats staging the sit-in? Ryan was referring to four gun control measures, addressing expanded background checks and "no fly, no buy" proposals that would have prohibited those on terror watch lists from purchasing firearms, that did not pass in the upper chamber earlier this week. In lieu of the failed legislation, Sen. Susan Collins, R-Maine, proposed a bipartisan compromise that would stop suspected terrorists from buying a gun. Democrats in the House proposed a similar amendment attached to a spending bill. The House Appropriations Committee debated the provision Wednesday, but it, too, failed to pass out of committee 16-31. Ryan pointed to the measure's failure as proof that gun control legislation did not have enough support in the House. "That amendment failed on a bipartisan basis," he said. "There was a vote. It was in a committee. The vote failed. On a regular order." Ryan also warned against future instances of "chaos" on the House floor, asserting that the continuing sit-in "it sets a very dangerous precedent." Asked whether the GOP-controlled body would take formal action against the Democrats for their flagrant rule violations, Ryan said, "We're reviewing everything right now as to what happened, and how to make sure that we can bring order to this chaos." The House adjourned for a two-week recess in the early hours Thursday, shortly after it passed a bill aimed at combatting the spread of the Zika virus in the U.S. Despite the recess, several Democratic members of the House remained on the floor carrying out the protest, which began shortly before noon on Wednesday and was led by civil rights icon Rep. John Lewis of Georgia. "Just because they cut and run in the dark of night, just because they have left doesn't mean we are taking no for an answer," Minority Leader Nancy Pelosi said Thursday.